Activist and photographer Bernard Kleina (left) talks to Chicago Freedom School graduate Richard Wilson at a recent commemoration for Dr. Martin Luther King. Photo by Mary C. Piemonte. People around the city recently celebrated the legacy of Dr. Martin Luther King Jr. while organizing to continue the fight for social justice. The Chicago Freedom School, a non-profit organization which trains people at all ages in social justice organizing techniques, hosted an “intergenerational” program to honor Dr. King’s activism in Chicago at Grace Place, 637 S. Dearborn St., several weeks ago. After the film, the program participants broke out into small groups for an interactive workshop on racially motivated gentrification tactics by wealthy realtors between 1905 and 1962. They also examined current housing segregation and displacement in Chicago more than 45 years after Dr. King’s work locally. In the small groups, the participants had to match up dates to example cases of segregation events that took place in the city before the Chicago Freedom Movement, such as the establishment of Chinatown around Van Buren and Clark streets in 1905. They also dealt with the proliferation of “racial restrictive covenants” that began in 1927; the “restrictive covenants” were contractual agreements among property owners that prohibited the purchase, lease or occupation of their building by a particular group of people, usually African Americans. The organizers then discussed how “redlining” of districts began in 1934, which primarily targeted African Americans, Latino, Asian and Jewish neighborhoods, deeming them “high risk” areas for real-estate investments and denying residents mortgages and home improvement loans, regardless of their financial history. The establishment of the Chicago Housing Authority in 1937 was another highlight of discussion, which the Freedom School organizers said resulted in massive amounts of public housing being constructed in black residential areas on the South and West sides, largely due to white aldermen who refused to allow public housing to be built in their wards. Construction of the Dan Ryan Expressway was another example the Freedom School organizers cited as having created “an enormous physical barrier” separating Black and white residents on the city’s South Side. First named the “South Route Expressway,” the new road was designed to travel along 400 west, a block from former Mayor Richard J. Daley’s home grounds in the Bridgeport area. But just a month after the former Robert Taylor Homes was approved to be built, the route was changed to go along Wentworth Avenue, “a street which was a well-established racial divide in the City,” according to the Freedom School. Jasmine Thomas, a 2011 Freedom School alumnus and senior at Young Women Leadership Charter School in the Bronzeville community, told RJ after the event that young people like her should become more like Dr. King and get involved in social justice issues. Chris Williams, a 2010 alumnus and senior at Walter Dyett High School, told RJ that by participating in CFS programs, he learned a lot about oppression and struggles within the community. He even gave a few speeches and did actions based on social justice. Williams added that young people should carry on Dr. King’s legacy. 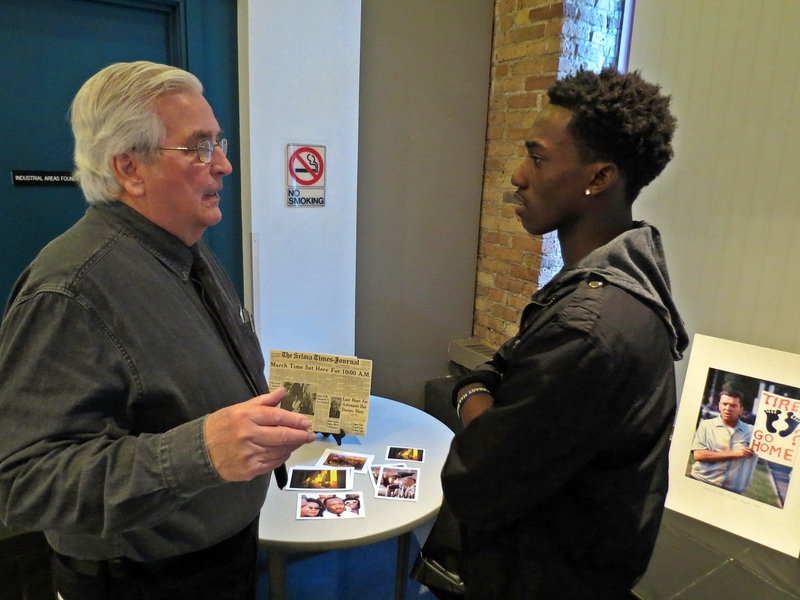 The program also included an exhibit of photographs of Dr. King and others during the Chicago Freedom Movement in Grant and Marquette Parks from 1965-66 captured by activist and photographer Bernard Kleina, who was a Catholic priest at that time. The event was sponsored by the Crossroads Fund. This entry was posted	on Friday, March 22nd, 2013 at 11:02 pm. You can follow any responses to this entry through the RSS 2.0 feed. You can leave a response, or trackback from your own site.